Iqbal Memorial Lecture: The Iqbal Memorial Lecture and Dinner has been scheduled on Saturday, April 25, 2015, at the Hilton Garden Inn, Bethesda, MD. The chief guest and keynote speaker will be Mr. Husain Haqqani, former ambassador of Pakistan to the United States and Sri Lanka. Currently, he is director for South and Central Asian Studies, Hudson Institute, Washington DC, and coeditor of the journal, Current Trends in Islamic Ideology. Martin Luther King Life and Legacy Award for 2015. Instituted 24 years ago, it recognizes those outstanding individuals who have made significant contributions in the realm of national or international affairs. The selection committee this year honored Mr. Islam, citing his international service. The award ceremony held in Washington on January 18, 2015 can be viewed by clicking the link here. Also Mr. Islam’s award remarks are available here. 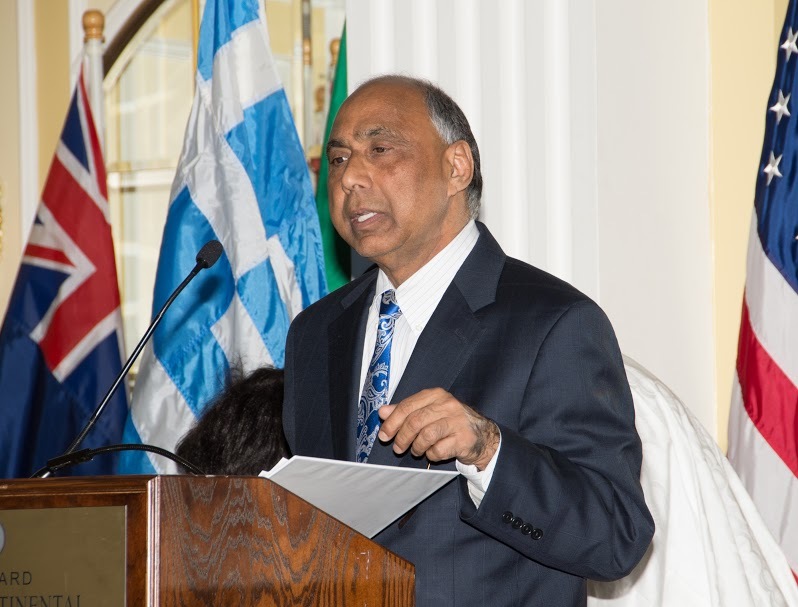 A Canadian-Alig Honored: A member of the AMU Alumni Community, Mr. Baidar Bakht, Scarborough, Ontario, Canada, had the title, Member of the Order of Canada, conferred upon him by the country’s Governor General, Sir David Johnston, on December 26, 2014 “for his contributions to the improvement of bridge design and his scholarship in making Urdu poetry accessible for Canadian audiences.” The award showcases Canada’s commitment to multiculturalism and linguistic diversity. Mr. Baidar Bakht graduated in civil engineering in 1962. Click here to read more about him. National Seminar on the Contribution of AMU Alumni to the Freedom Struggle: Speaking at the seminar organized to examine the contribution of AMU alumni to the freedom movement, Professor Shan Mohammad cited the example of Sir Syed Ahmad Khan who dared to publish a book under the tile Asbab Baghawat-e-Hind, wherein he held the British responsible for the outbreak of the 1857 revolt. A number of Alumni who had participated in India’s freedom struggle were also mentioned and their contributions recounted. International Symposium on Breast Cancer: The Jawaharlal Nehru Medical College’s Department of Pathology is organizing an International symposium on breast, cervical and ovarian cancers, and new therapeutic measures to treat them. Some well-recognized researchers from India and abroad are expected to participate. Mr. Mukhtar Masood is a retired senior Pakistani Civil Servant and a gifted Urdu writer. His entire student life from high school to graduate school was spent at AMU. His enduring love for his Alma Mater and his sentimental attachment to its time-honored traditions permeates the pages of the books he authored, Aawaz-e-Dost, Looh-e-Ayyam and Safar-e-Naseeb. The following piece is an adaptation from his book, Safar-e-Naseeb. Masood Saheb presents a beguiling portrait of his favorite professor at AMU, Dr. L K Haider, whom few would now know or recognize, and his endearing eccentricities. When I first encountered Professor Lodhi Karim Haider, head of the department of economics, popularly known as LK Haider, I was struck by the contrast between the two of us. He was an impressive, intimidating personality, educated at the best universities of Europe and a world-renowned economist. In contrast, I was a mere youngster, thin, tall and insecure. He barely noticed me. He normally wore a Harris Tweed Jacket and Jodhpuri pants. On Eid, however, he changed into Shalwar-Qammez and a Peshawari turban (Qullah and Dastar). Dr. Haider lived with his German wife quietly in a bungalow (Kothi) allotted by the University; the house always seemed to be shrouded in some mystifying silence. In 1926, the Government of India borrowed his service to be a member of the Royal Agricultural Commission entrusted with the task of recommending ways to ease the threatening famine. The Commission members toured the country in great luxury and splendor, with a special train at their disposal, and each member entitled to a separate saloon. Dr. Haider was later appointed a member of Federal Public Service Commission, the only Muslim. The Commission interviewed and selected members of the prestigious Indian Civil Service (ICS). Soon, he found himself in great trouble, inundated by job seekers bringing recommendations from influential friends, which he invariably ignored. It was generally believed that Dr. Haider would move up either to become the chairman of the Federal Public Service Commission or a member of the Viceroy’s Executive Council, both highly coveted positions. Instead, he chose to return to Aligarh to his former modest teaching position. Defying all conventional wisdom, he adjusted very well and seamlessly resumed his old teaching routine. Dr. Haider passionately loved riding. During summer months, whilst most senior professors repaired to hill stations, he preferred to endure Aligarh’s heat and humidity. His only concession to heat was a hand-held fan and a thick, cotton shirt that absorbed sweat. However, he saw to it that the stable for his horses was lined by ice slabs to minimize their discomfort. In winter, he kept warm by chopping wood in his backyard in the mornings, while the servants inside enjoyed the use of the fireplace. Professor L K Haider finally retired in 1947 to his ancestral village, Kahuta, nearly Rawalpindi. Characteristically, his last day at the University was unremarkable. No emotional farewells, no tearful goodbyes. As usual, he punctually arrived to teach his class, unhurriedly covered his subject and when the bell rang quietly exited for the last time. Amazon.com donate to AAA each time you shop. Click on the right to donate.